How Do I Obtain A Project Wild Activity Guide? Project WILD is one of the most widely-used conservation and environmental education programs among educators of students in kindergarten through high school. The program emphasizes wildlife because of their intrinsic, ecological value as well as their role in teaching how ecosystems function. In the face of competing needs and pressures affecting the quality and sustainability of life on earth, Project WILD addresses the need for human beings to develop as responsible citizens of our planet. It is based on the premise that young people and educators have a vital interest in learning about our natural world. Project WILD's primary audience is educators of kindergarten through high school students. However, this does not limit the usefulness of Project WILD to formal educational settings. Volunteers working with young people in pre-school and after-school programs; representatives of private conservation, industry, or other community groups who are interested in providing instructional programs for young people or their educators; and personnel involved in preparation of future teachers are all among those who effectively use the instructional resources of this program. Over 1 million educators in the U.S. have participated in Project WILD workshops since the program began. These educators in turn have provided instruction using Project WILD to more than 48 million youths. The NEW AND REVISED in 2018 Basic Activity focuses on a variety of wildlife and habitats. 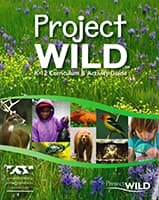 This 4th edition of the Project WILD "Terrestrial" guide includes expanded and updated educational methodology and environmental topics. The guide contains six new activities with a focus on the ecology and conservation of bees, bats, reptiles, and monarch butterflies, as well as stewardship activities relating to changing plant and animal life cycle events, and the reduction of light pollution, and includes information on the North American Model of Wildlife Conservation. The guide also includes a greater diversity of topics, species, field investigations, and educator resources. Every activity includes an outdoor component, an 'In Step with STEM' extension, and 'WILD Work' career and occupation extensions. It is organized into topic units and is based on the Project WILD conceptual framework. Because these activities are designed for integration into existing courses of study, instructors may use one or many Project WILD activities, or the entire set of activities may serve quite effectively as the basis for a course of study. 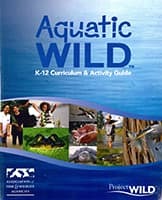 The NEW REVISED AND UPDATED Project WILD Aquatic K-12 Curriculum and Activity Guide emphasizes aquatic wildlife and aquatic ecosystems with 40 multidisciplinary activities for grades K-12. It is organized in topic units and is based on the Project WILD conceptual framework. Because these activities are designed for integration into existing courses of study, instructors may use one or many Project WILD Aquatic activities or the entire set of activities may serve quite effectively as the basis for a course of study. Each Project WILD Aquatic activity contains all the information needed to conduct that activity including objectives, method, background information, a list of materials needed, procedures, evaluation suggestions, recommended grade levels, subject areas, duration, group size, setting, and key terms. A glossary is provided, as well as a cross-reference by topics and skills. Growing Up WILD is an early childhood education program that builds on children's sense of wonder about nature and invites them to explore wildlife and the world around them. Through a wide range of activities and experiences, Growing Up WILD provides an early foundation for developing positive impressions about the natural world and lifelong social and academic skills. Growing Up WILD is a multi-award winning program having received the 2009 Family Choice Award and an award from the Renewable Natural Resource Foundation. Includes outdoor explorations, scientific inquiry, art projects, music and movement, conservation activities, reading and math connections and "Healthy Me" dovetailing with the Let's Move Campaign. Through activities involving language arts, social science and math experiences, coupled with community outreach and service learning applications, Flying WILD offers a whole-school approach to environmental education using birds as the focus. Targeted for the middle-school audience, though widely adaptable, Flying WILD offers practical hands-on classroom and outdoor field investigation experiences connecting real-world experiences in bird biology, conservation and natural history. Project-based classroom applications, service learning and community involvement are encouraged through sections of the guide dedicated to the planning and implementation of birding festivals. 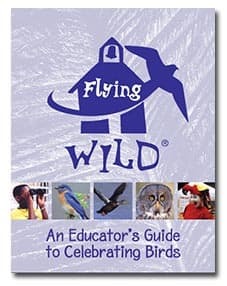 The main purpose of the Flying WILD: An Educator's Guide to Celebrating Birds is to provide activities that teach middle-school students about birds, their migration, and what people can do to help birds and their habitats. The Guide's many activities can be used to teach classroom lessons or to initiate service-learning projects that help birds and their habitats. The Guide helps middle-grade students, teachers, and community volunteers implement a bird festival at their school. Within the Guide's pages you will find a wealth of activities, ideas, and tips for hosting your own school bird festival, from recruiting committees and pre-festival donations to after-festival lean-up and follow-up evaluation. In conjunction with the Flying WILD program, the Guide creates a unique opportunity for students, teachers, and the community to come together to learn about birds through innovative, hands-on, minds-on activities. Fun and fascinating activities involve volunteers at various levels of ability and participation. All 43 activities focus on learning about birds through contests, quizzes, and hands-on projects-and 19 of those activities are designed to be led by the students themselves. Join the fun while learning about what you can do to help protect migratory birds. The Project WILD activity guides are available when you participate in a Project Wild Workshop. Realizing that a workshop may not be available at a time or date that you can participate, all of the current activity guides have been placed in the Maine State Library, and are available to borrow via their system. If you wish to borrow a guide to use as a reference, please contact the Maine State Library directly at: http://www.maine.gov/msl/ or 287-5600. The Flying WILD and Growing Up WILD guides may be purchased directly from the national web site for each. Maine's Project WILD Basic, Project WILD Aquatic, Wild School Sites, Growing Up WILD, and Flying WILD Teacher Workshop fees are $25 per person. assist participants with integration of WILD activities into their curriculums. WILD workshops are conducted on a statewide basis by trained volunteer facilitators. Workshops may be scheduled year 'round at a variety of locations. A workshop can be scheduled for an entire school district, an individual school, as a part of college methods courses, at conferences; on in-service days, professional days, early-release days, weekends or during vacations. WILD workshops are designed so teachers become familiar with the activities and their multidisciplinary use in the classroom. Teachers actively participate in a wide array of WILD activities. Learn of other Maine conservation education resources. Receive current Maine wildlife information and a variety of posters, prizes and resources directly supporting wildlife and conservation education in your classroom. For more information, contact: Lisa Kane, Project WILD Coordinator, Dept. of Inland Fisheries and Wildlife 284 State St. 41 State House Station, Augusta, ME 04333 (207) 557-0118 or email Lisa Kane. Join us for this lively and engaging professional workshop at our Fields Pond Center, where you will be doing hands-on activities in our pond. Participants are introduced to Project Aquatic WILD materials, activities, and strategies. Educators gain the experience and confidence needed to work with their students and to integrate Project WILD into their teaching. All participants will receive the NEW REVISED AND UPDATED Project WILD Aquatic K-12 Curriculum and Activity Guide emphasizes aquatic wildlife and aquatic ecosystems with 40 multidisciplinary activities for grades K-12. Each Project WILD Aquatic activity contains objectives, method, background information, a list of materials needed, procedures, evaluation suggestions, recommended grade levels, subject areas, duration, group size, setting and key terms. A glossary is provided, as well as a cross-reference by topics and skills. Field investigation activities in Aquatic WILD enable students to learn methods and protocol for conducting scientific investigations, including how to formulate a research question, engaging in systematic data collection, and drawing conclusions. The In Step with STEM activity extensions make use of a variety of tools and instruments, from litmus tests to smartphone applications, and involve students in the application of technology, science concepts, and math skills as part of their problem-solving efforts. Contact hours provided. Participants will also receive a variety of fish and wildlife posters, publications and handouts supplied by the Maine Department of Inland Fisheries and Wildlife. Project WILD is sponsored by the Maine Department of Inland Fisheries and Wildlife. The activities are adaptable to various time frames, activity sites, and subject areas. Project WILD is highly adaptable to different grade levels, student populations, and learning styles. The guide is full of activities that can be done in the classroom, the schoolyard, or on field trips. Teachers give high praise to Project WILD's "learning by doing" orientation to workshops and report reaching all students at all ability levels with Project WILD. Participants receive a variety of wildlife posters, publications and handouts from the Maine Dept. of Fish and Wildlife.